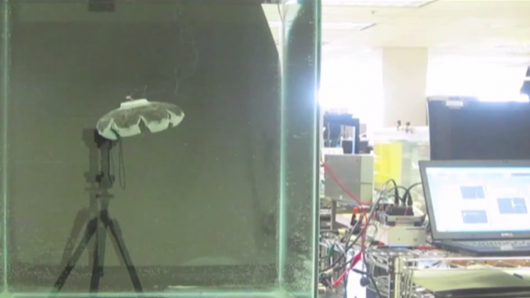 Researchers have created a silicone submarinal robot that gets about by mimicking the motion of a jellyfish. The robot is powered by heat-producing reactions catalyzed by its surface, and using hydrogen and oxygen present in the water as fuel. It’s claimed that that the Robojelly, so named by its Virginia Tech creators, could run indefinitely, effectively drawing energy from the water in which it swims. The actuators themselves are made of a nickel-titanium shape memory alloy wrapped with multi-wall carbon nanotube sheets which are themselves coated with a catalytic platinum powder. The reactions, which use hydrgoen and oxygen as fuel, generate heat which in turn “activates” the shape memory alloy actuators. The byproduct of the reaction is vaporized water, which the researchers claim has no adverse environmental effect. The means of propulsion received a boost, in a very literal sense, last year, when the researchers discovered that cutting slots into the bell reduced an unwanted folding effect in the materials that reduced Robojelly’s performance. It is hoped that the robot, funded by the Office of Naval Research and in development since 2009, will pave the way for an unmanned surveillance submarine. Should such a robot ever reach the rolling seas, the nations of the world will presumably draw comfort from the fact that their robot jellyfish watchers have an extremely green source of power. The next phase of the research seeks to energize the robot’s various segments individually, allowing directional control. Check out the video’s bio-inspired motion in the video below.